Sri Lanka Army de-miners with their Cambodian counterparts in Muhamalai. 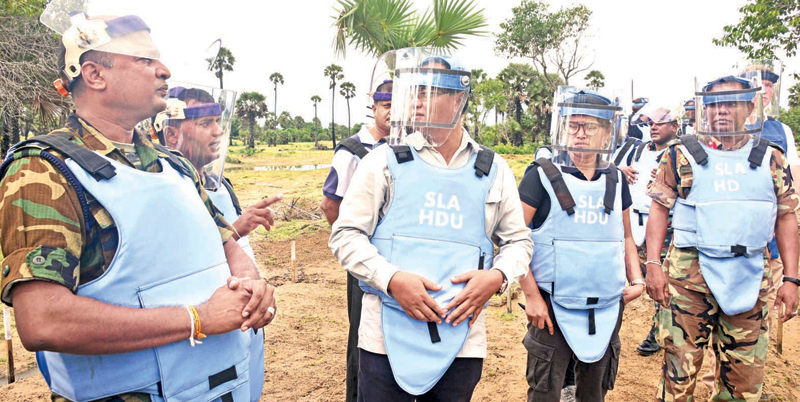 A nine-member delegation of the Cambodian Mine Action Authority (CMAA) of the Cambodian government visited the Muhamalai Humanitarian De-mining site on Wednesday, to learn from the Sri Lanka Army’s de-miners. The delegation comprising CMAA Secretary General Prum Sophakmonkol, Deputy Secretary General Tep Kallyan, Strategic Management and Residual Contaminations Adviser Rob White, Department Director of Victim Assistance Adviser Mao Bunnhath, Chief Technical Adviser Mine Action, UNDP Cambodia, Ediwin Fraigmane, CMAA Social Economic Planning and Database Management Director Tan Sara, Department of Regulation and Monitoring Director Chim Chansideth, Deputy Data Base Manager Ros Sophal, and Cambodia Mines Advisory Group (MAG) Programme Officer Buth Rothana, was received by Engineers’ Brigade Commander Brigadier Nihal Amarasekara, on arrival at Muhamalai. Sri Lanka Army Humanitarian De-mining Unit (HDU) 10 Field Engineer Regiment Commanding Officer Major Waruna Ponnamperuma presented a comprehensive briefing to the visitors on the Army de-mining project in Muhamalai and adjoining areas. After they were taken to the site, Army manual and mechanical de-mining teams staged field demonstrations, leaving space for them to interact with de-miners at work. Towards the end of the near three-hour long demonstration, the delegation called at the HALO Trust resettlement site in Muhamalai where other non-governmental de-miners are at work. The next segment of their visit included a discussion at the Regional Mine Action Office (RMAO) at Kilinochchi. Mahinda Wickramasinghe, Assistant Director, Mine Action and Head of Mine Action Operation, National Mine Action Centre (NMAC) of Sri Lanka, Neil Fernando, Assistant Director, Resettlement, Rehabilitation, Northern Development and Hindu Religious Affairs Ministry, D.M.S.K Dissanayake, Victim Assistance Office, NMAC, G.D.L Sirikumara, Development Officer, Resettlement, Rehabilitation, Northern Development and Hindu Religious Affairs Ministry and J.A.R Jayalath of the NMAC were associated with the delegation’s visit to Muhamalai. Before their departure, the delegation is expected to attend a full-day workshop at the National Mine Action Centre in Colombo. The Secretary to the Resettlement, Rehabilitation, Northern Development and Hindu Religious Affairs Ministry is expected to speak to the group on the progress of de-mining work in Sri Lanka. Sri Lanka Army Humanitarian De-mining Unit (SLA-HDU) would also contribute to the deliberations in Colombo.